The global functional flour market witnesses the dominance of some large companies that are present in both global and local markets, says Transparency Market Research (TMR) in a new report. However, this market is teeming with small companies that predominantly operate in local markets. Expansion of product portfolio to serve ancillary sectors is what companies are focused on to buoy growth. Large companies are engaged in acquisitions and strategic alliances with small companies to expand expertise in specialty foods and to expand geographical outreach. Key companies in the global functional flour market include Cargill Incorporated, SunOpta Inc., The Scoular Company, The Hain Celestial Group Inc., Archer Daniels Midland Company, Associated British Foods plc,., General Mills Inc., Parrish and Heimbecker Limited, Con Agra Foods Inc., and ITC Limited. 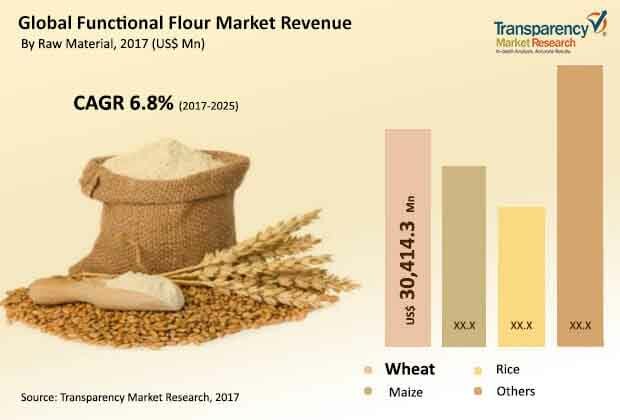 According to estimates presented by a report by TMR, the global functional flour market is likely to expand at a CAGR of 6.8% in terms of revenue between 2017 and 2025, for the market to be worth US$126.8 bn by 2025 end. The opportunities in the market were evaluated to be worth US$70.4 bn in 2016. Among the key raw material segments, wheat currently holds the leading market share; gong ahead too, the segment is likely to hold on to its leading position. By product, genetically modified flour is likely to continue to display the leading demand in the years ahead. North America, among key regional markets, held prominence in the global functional flour market in the recent past. Majorly fuelling the functional flour market is rising demand for bakery products. Bakery items such as bread and bun are staple foods of households especially in developed countries in North America and Europe. Ready-to-eat bakery products such as cakes and biscuits find extensive demand especially among youth and children. These products are also consumed as on-the-go foods due to ease of packing. The availability of these foods in whole wheat and multi grain variants is leading to their increasing demand among health conscious consumers. On the other hand, rising disposable income and changing food habits are increasing their uptake in developing economies. Consumers in developing countries in Asia Pacific such as China and India are increasingly adopting Western food habits with changing lifestyle and rising preference for health-benefitting foods. Shifting consumer preference from conventional wheat-based flour to functional flour such as oat flour, rye flour, and soy flour for their nutritional value is aiding the functional flour market in these regions. The surging demand for healthy variants of ready-to-eat foods such as bread, biscuits, and cakes is another key factor behind the growth of functional flour market in developing regions. Apart from this, increasing demand for low gluten or gluten-free foods is fuelling the functional flour market. Increasing allergies for gluten and rising awareness of health benefits of combination grains is also aiding the growth of functional flour market in these regions. Functional flour is obtained from a combination of grain flour and non-grain flour that has low-gluten content than traditionally consumed single grain flour. Improved nutritional value along with low gluten content are stoking the demand for functional flours. On the flip side, price volatility of grains leading to low profit margins of millers is dissuading their interest for production of specialty flours. In addition, declining consumption of flour mainly for health reasons and increasing switch towards value-based processed bakery or industrial bakery foods is challenging the growth of functional flour market.